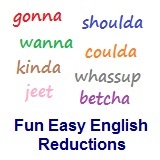 ﻿ Fun Easy English - new-american-english-reductions-reduced-words-topic-word-have-could-have-coulda. In this lesson you will learn the American English reduction coulda. I coulda eaten one more cookie. I could have eaten one more cookie. She coulda been a little nicer. He coulda been a bit quieter. I coulda spent another week with that girl. They coulda won the game if the other quarterback was playing. Coulda is used quite often in normal conversation especially among kids. Reductions, such as coulda are not real words in English.